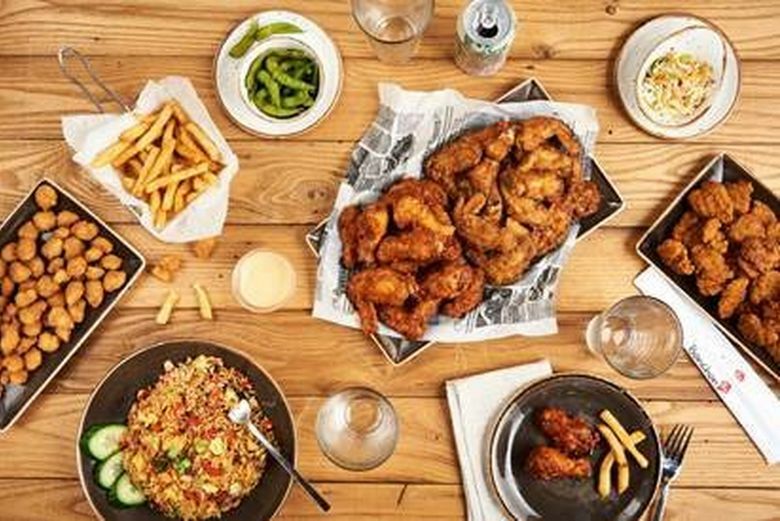 Bonchon is the undisputed big opening this month, a Korean chain that’s as popular as Shake Shack. 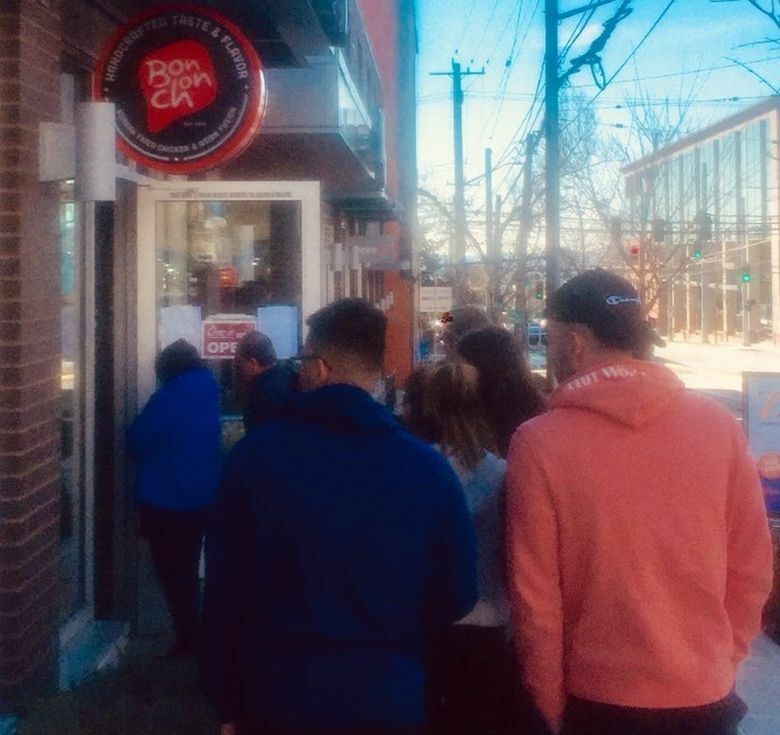 Patrons have had to wait at least 30 minutes for a taste of its fried chicken since it debuted on First Hill. As of last Sunday, no carryout orders are being accepted as the kitchen tries to keep up with service. The full menu isn’t even offered yet as the cooks have been in the weeds. Unless you’re one of those young foodies who revel in the buzz, you might want to give this spot some time to avoid the lines — maybe try it in May. Most food including the signature wings are made to order, so service is slower than at most fast-food chains. I got a tip to go Sunday before the 11:30 a.m. opening when the line supposedly wasn’t as long. Apparently a zillion other fans got that same tip. At 11:20 a.m., the line almost wrapped around the block, with many holding spots for their parties who were still parking or running late. 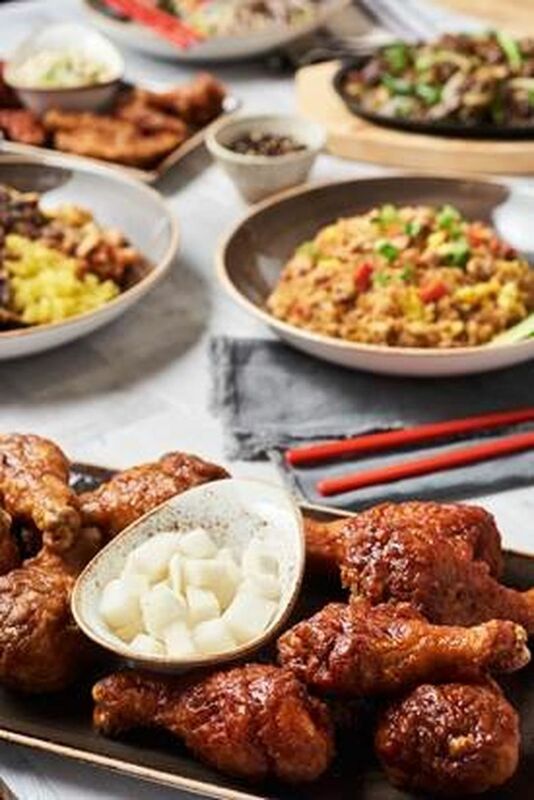 Bonchon started in South Korea and became mainstream popular after the international chain opened its flagship restaurant in New York City in 2010. 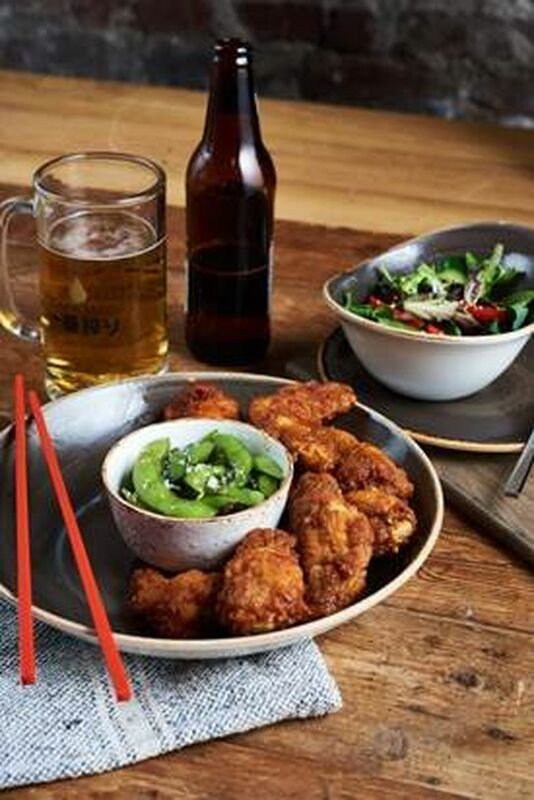 It helped introduce the spicy, sticky umami-laden wings to an American audience, which nicknamed it “the other KFC.” If you’re curious about this “KFC,” and don’t have the patience for the long lines, do what New York transplants did before Bonchon’s arrival: hit Bok A Bok in White Center or Capitol Hill or Chan in Pike Place Market for the Korean wings. In other opening news … Capitol Hill gets two fine-dining spots: Violet, located in the former Chavez space, is headed by William Belickis, formerly of Mistral Kitchen in South Lake Union. The restaurant is still in soft-opening mode without a website. Past menus have featured Muscovy duck breast and foie gras. On its social media, the restaurant announced it will do “American omakase.” Inside an unassuming building on Broadway East sits Taneda Sushi in Kaiseki, which does just chef tasting menus. The starting price for a multicourse meal is $78 and an “ultimate” chef-choice menu which includes about eight appetizers and 15 sushi is listed at $100. The nine-seat spot offers only two seatings (5:30 p.m. and 7:45 p.m.) on Sundays and Tuesdays-Thursdays, and three seatings (5 p.m., 7 p.m. and 9 p.m.) on Fridays and Saturdays. But the Capitol Hill opening hogging the spotlight is a counter-window spot at the other end of the price spectrum. Yalla hawks Middle Eastern street food with prices ranging from $6 to $8.50. Hummus and lamb meat are served with the Arabic bread saj — a thinner version of pita bread. No phone or website is available yet, but hours are Sunday-Thursdays 4 p.m.-1 a.m. and on Fridays and Saturdays 4 p.m.-2 a.m. It’s next to the dive Montana. A half-mile north of Yalla is the Spanish spot A La Vida Tapas along Summit Avenue East. Away from the madness on the main drag of Ballard, Watson’s Counter does Asian fusion such as Korean poutine with braised short ribs, pork belly and rice and yes, Korean wings if you don’t want to deal with the lines at Bonchon. In South Lake Union, Thomas Street Warehouse does a menu of $5.95 pub grub from tacos to chicken fingers. Texians BBQ opened along The Ave. The ribs and briskets are, eh, so-so at best. At least on a recent visit. But starving students won’t complain. Portions were absurdly generous. The $20 mix-and-match deal gets you at least a pound of meat (you pick any two meats along with any two sides), enough to feed two. Judging by the other tables, there were plenty for leftovers. And there are $3 Rolling Rock beers to wash down all that smoky meat. You’ve got to give it to Arriba Cantina, which has some chutzpah, opening by three of the biggest name restaurants in Seattle, (Edouardo Jordan’s JuneBaby, Salare and Lucinda Grain Bar.) Arriba does gussied-up Mexican food such as $17 shrimp tamales and $16 crab quesadillas. Phorale, the Mexican-Vietnamese fusion pho-and-banh-mi shop that found a cult following in South Park before shutting down, returns — as a food truck. Its roll-out event is scheduled for March 23 at the courtyard of Bar Ciudad. The owners added more sandwiches and rice bowl options, though pho will have to wait until the crew can work out all the kinks in the truck. West Seattle’s Falafel Salam is also now in Georgetown, where owner Shimi Kahn promises a funky project unlike any other. It’s currently a trailer with outdoor seating. He’s building a greenhouse for indoor seating and outfitting an Airstream as a bar. Stay tuned. Nearby Georgetown Deli and Market, formerly Hitchcock Deli, offers a dozen sandwich-and-salad options including Cubanos and meatballs. Sandwiches range from $10-$13. By the way, the former owner of Hitchcock Deli, Brendan McGill, opened Bar Hitchcock on Bainbridge Island, an espresso spot in the morning and a restaurant and cocktail bar in the evening with seafood and bar snacks. Greenwood Flame Burgers offers veggie and chicken patties along with its namesake burger, most priced under $7. Currant Bistro opened on the ground floor of The Sound Hotel in Belltown, a menu of mostly flatbreads and burgers. However, even with a simple lineup, the food has been uneven, from an overcooked burger to a salty flatbread. At this rate, we really will have a ramen house in every neighborhood. Pioneer Square gets Izumi Ramen. Nearby is Jujubeet, its fifth juice bar in King County. And rise to a cup-of-joe at: Tougo Coffee Co. on First Hill, Venture Coffee in Ballard, Ugly Mug Café near the Interbay Golf Center and Poindexter Coffee in the University District, where there’s now the hot rooftop bar Mountaineering Club. The Australian chain Jesters is a tenant in Bellevue Square, selling meat pies. 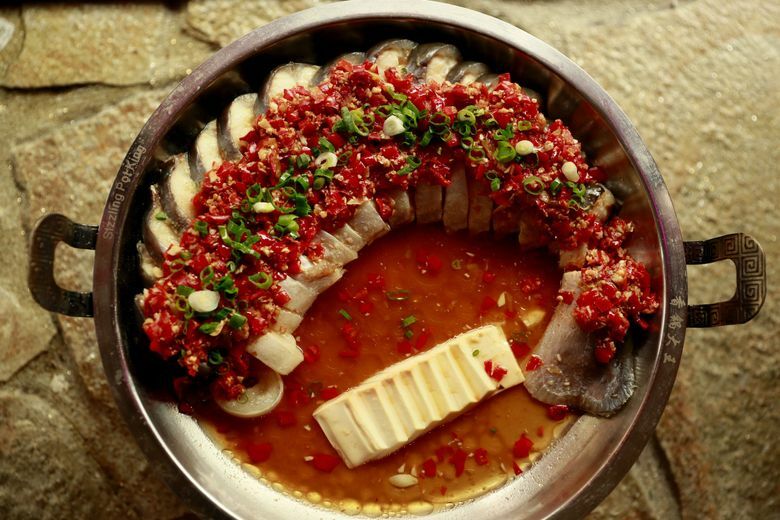 Gourmet Sichuan specializes in grilled and steamed whole fish and also hot pot, while the Laotian cuisine and hot-pot spot Blazing Bowl comes to the Crossroad Shopping Center. Also there’s the opening of the boba spot Over the Rainbow Tea Bar and Five Stones Coffee Company. In Redmond is Joys Asian Restaurant doing dan dan noodles and Sichuan food. Redmond Town Center gets two spots: Hong Noodle, which does ramen and izayaka fare, and Fuji Steakhouse, which does teppanyaki tableside grilling. In Issaquah, Tandoori Pizza is where Indian food meets Italian with toppings such as paneer cheese and halal chicken. You can also get traditional pizza. In Kirkland, 203ºF Coffee Co. is a spot for Eastsiders to geek out over coffee. 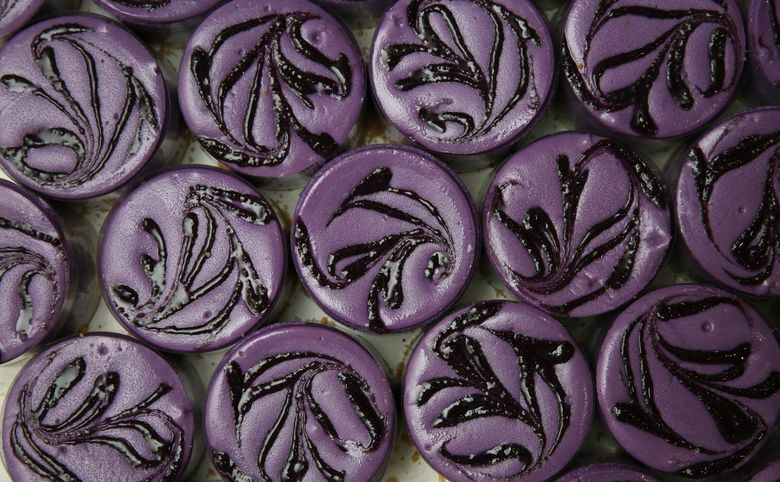 Pastries and lamb sandwiches are also available. A favorite Seattle haunt for Hawaiian comfort food, Kona Kitchen expanded to Lynnwood with all the favorites including loco moco, Spam fried rice and kalua pig. Two miles northwest, Mugen Sushi does all-you-can-eat sushi for $24.99 during lunch and $29.99 during dinner. But the biggest buzz around Lynnwood is BBQ Chicken inside the H Mart building. At Alderwood Mall, Back9 Parlor offers virtual golf and video games and familiar bar grub: onion rings, hot dogs and nachos. Sizzling Pot King, a surprise hit in Seattle and Bellevue, takes its Hunan comfort food to Shoreline. In downtown Kent, Afghan Cuisine Kent has opened, doing lamb kebab and the steamed beef dumplings, mantu. Also, S Level Tea offers a more extensive lineup than just pearl tea — expect crabmeat tater tots and banh mis. Aceituno’s, with its popular $1.25 Taco Tuesday, expands to Tukwila. In Renton are Sansonina Ristorante Italiano, Mezcal Fresh Mexican Grill and Boon Boona Coffee.